If you only need a few more Play credits to buy that game or rent a movie, then you might be interested in a new app simply called Google Opinion Rewards. Just as its name suggests, all you have to do to earn credit is to answer a weekly survey with up to ten questions each. Of course, you’ll have to enter in your Google Walletcredentials first so that it’ll know where to send that money. As for what sort of questions you may expect, Google is partnering up with a variety of researchers from brands like P&G, Lowes and Priceline who need public insight on topics like the best promotional campaign or what sort of cars you might be interested in. Sure it takes awhile to answer a few questions and you’ll be an inadvertent pawn in a corporate marketing strategy, but you’ll soon forget all that once you get to the next level in Candy Crush. Google’s desire to integrate social features into its mobile OS will soon see it use Google+ profile photos to identify Android callers. The new feature comes as an update to the new caller ID service in Android 4.4 KitKat, allowing the company to automatically match phone numbers from incoming and outgoing calls with names and profile photos associated with a registered account. Google staffer Attila Bodisnotes that the feature will be enabled in “early 2014″ but can only display names and profile photos if the user has verified their phone number and has discovery switched on. While the idea is to bring a sense of familiarity to phone calls, not everyone will see the merit of sending a headshot to people they call — so Google is offering an way to opt out. Simply head on over to this link, untick the checkbox and all of your Android-toting friends will no longer be able to see your beautiful face (unless, of course, they add it themselves). By now we all know that Google’s not-so-secret Nexus 5 is for sale. We got our hands on a review unit and here are our initial impressions. Keep in mind that these are only first impressions after having used it for a few hours and so haven’t completely taken it through the wringer, but we wanted to show you what you can expect for this $349 and $399 phone. There’s nothing that makes the packaging stand out among all of the other Nexus devices, but when you open up the box and take out the Nexus 5, this is where your new Nexus experience begins. At just 8.59 millimeters and weighing 4.8 ounces, the smartphone is extremely thin and light — it almost felt as though it could break while in your hands. The 5-inch display makes it suitable to fit in the palm of your hands, but while carrying it in my pocket while walking through San Francisco, it sort of felt like it was out of place — perhaps I’ve grown too accustomed to the fact that I’ve had 3- to 4-inch phones for the past few years. Although you can hold the device in one hand, it doesn’t immediately feel comfortable enough size to manage all your affairs as such. Trying to type out emails or using certain apps required the use of both hands. Users will notice that the display is sharp, perhaps akin to Apple’s Retina display. All the details of the icons and content on the phone are pretty clearly visible. 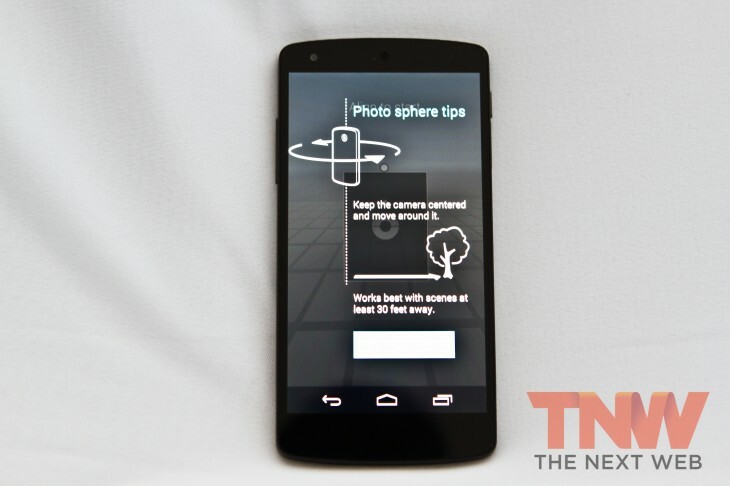 LG is the company behind the Nexus 5. The construction appears to be pretty sturdy and it’s quite easy to grip. However, the Corning Gorilla Glass 3 screendoes make it prone to smudges and fingerprints and almost as soon as I took the phone out of the box and removed the screen covering, a fingerprint emerged. The camera has 8.1 megapixels and comes with optical image stabilization. It takes some pretty good photographs which we’ll be showing off later, including HDR and Photo Spheres. There’s a single flash on the Nexus 5, which when enabled, will turn on as you try and focus on something in a darkened room. So if you plan on taking photos at a night club or in the evening, better warn people of two flashes. 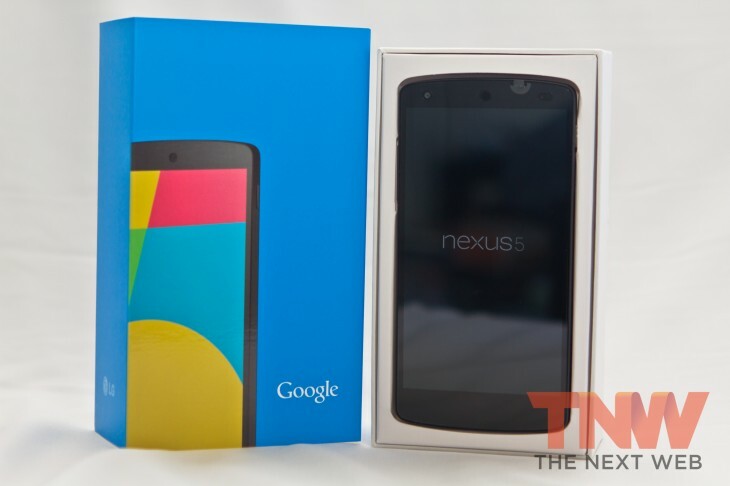 So what about KitKat, Google’s latest Android operating system? In my preliminary assessment, it’s stable and useful. The fact that Google Now has been incorporated so well into the platform so that it’s accessible from any of the home screen windows will hopefully help users find what they want quicker. In a bit of a pet peeve, the phone will respond to anyone that says “OK Google”. It’s interesting that KitKat hasn’t incorporated the same preventative measure that Google has with its Glass product (it won’t activate when random people walk by and scream “OK Google” into the device). Nevertheless, I found Google Now useful, especially when I asked it to open apps. Gmail and Flipboard opened instantly, though Instagram failed to open on cue. Why that happened is unknown, so a bit of tweaking could be done — it’s still far from perfect. The overall appearance of Android 4.4 is decent, but if you’re expecting a remarkable overhaul from Jellybean, you’re going to be disappointed. Although the aesthetics haven’t changed that dramatically, the experience itself has. 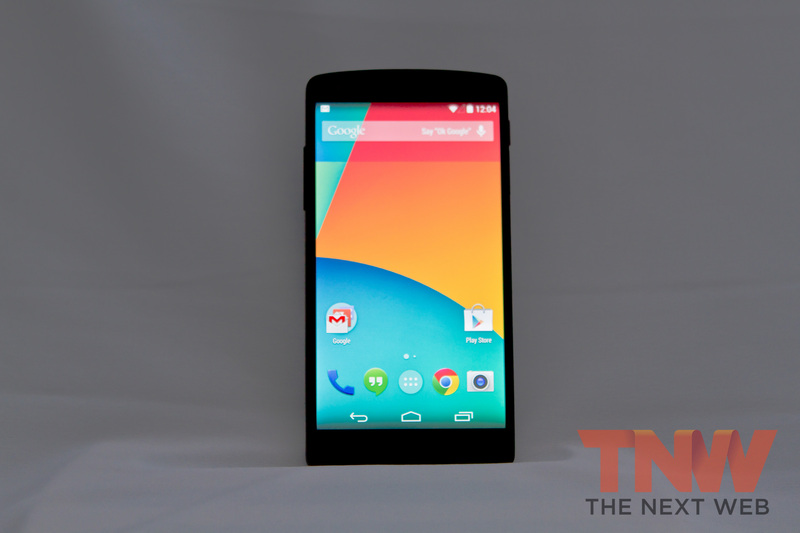 We’ll dive deeper into this when we have an opportunity to do a more in-depth review of the Nexus 5. 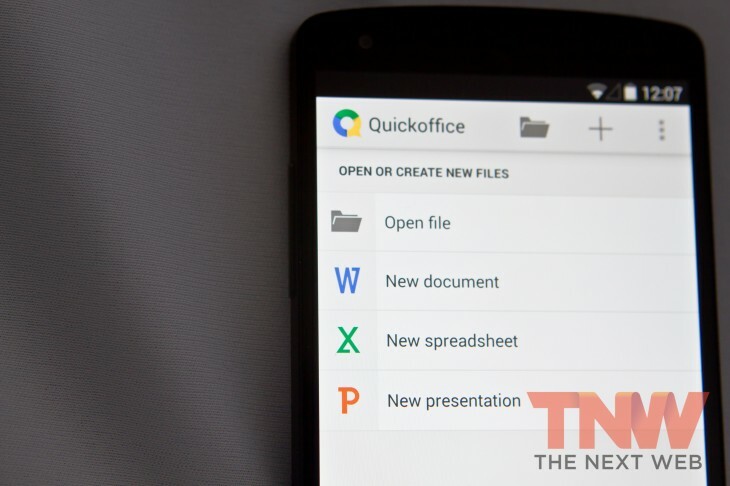 Nexus 5 owners will also find that it includes the latest Hangouts app, which lets you to send SMS and MMS messages, along with Quickoffice, which enables you to open or create new documents, spreadsheets, and presentations — a potential rival to Microsoft Office. Google Wallet also comes installed on KitKat, which is needed in order to take advantage of the “Tap & pay” feature. When I received the phone it had a fully charged battery. After seven hours, it still has 56 percent remaining after setting it up, installing apps, checking email, taking a few photos, and surfing the Web. Besides that, the rest of the power consumption was through the screen being on and also Google Search. However, as I begin to use it more with Twitter, Instagram, Facebook, and checking email, it will be interesting to see how well the battery stands up. Plastic cases are also available for the Nexus 5 and Google included a florescent orange/pink one — it’s noticeably bright so you won’t miss it in a darkened environment. It’s flimsy, but sturdy enough for those who want some added protection for their device without paying a lot for it. Based on the few hours we’ve had to play with the Nexus 5, it’s a solid-looking and flexible device that has the potential to help you get the information you want, make sure you arrive at your destination safely, and be a productivity workhorse. This device may be Google’s effort to stand up against the likes of the iPhone 5s, the HTC One, or the Samsung Galaxy S4, but it might fall short of that aspiration. 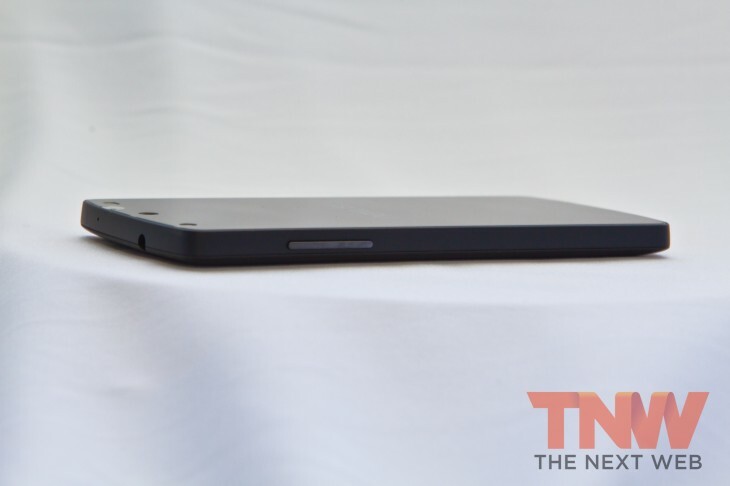 It’s certainly offering some premium features, but at an affordable price point. You use this because it’s simple to understand and easy to use. Did you know it’s consistently 3 times slower than the way you learned to do it in high-school? Don’t forget to write i–. The first time you’ll try this you’ll write i++ out of habit and you won’t know why it crashed .This subject is pretty deep and it involves the JIT (Just In Time compiler) and automatic usage of Iterators behind the scenes as well. When you’re not sure what really matters in terms of speed the best way to figure it out is to write a small test yourself and run it directly on the emulator by measuring time the good old way with System.currentMillis()! Tour De Hiru app is Sri Lanka’s First Road Racing Mobile app. A single app that can serve as an automatic silencer, a notification tool, an alarm clock and a task manager, targeting the entire productivity cycle under a simple user interface. Bhasha has created an Android app to view Baiscope Sinhalen. App is a CSR project of Bhasha. Go ahead, Grab it here to your android device.